Online bullying is a very serious problem nowadays. Apparently, something mean or aggressive is said on Twitter every 60 seconds. So what are we to do against such meanness? Enter TheNiceBot. 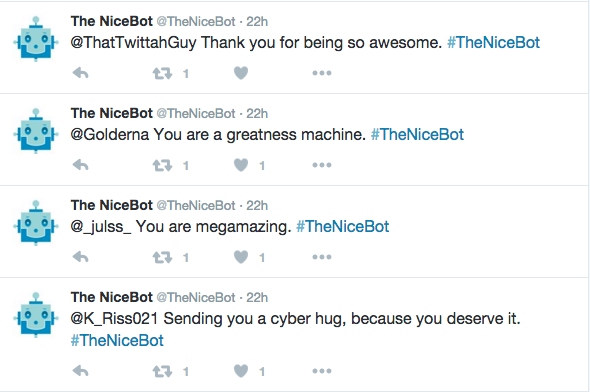 TheNiceBot is a Twitter account that tweets nothing but nice things and compliments every 30 seconds in an effort to combat the negativity on the Internet. The account works randomly, so maybe when you open up your Twitter tomorrow, you'll have a sweet little message from TheNiceBot. The goal is to reach all 300 million Twitter users, so it's a definite possibility! This Twitter bot (an account that is programmed to run on its own) is the brainchild of Champions Against Bullying and Deutsch Inc. advertising agency. Deutsch Inc.'s Executive Creative Director Jeff Vinick said that, "We started thinking about different ways to be nice to as many people as possible, and a spambot seemed like a good solution. And while spam is normally thought of as something negative, we figured that if the message was simple and positive enough, people would respond favorably — and maybe even be tempted to spread some niceness themselves." Will TheNiceBot change the face of the Internet? Probably not. However, any step towards kindness is a step in the right direction. To us, this really does seem like the best kind of spam. So why not take it upon ourselves to get inspired by TheNiceBot, and spread more kindness around ourselves? Take the time to compliment the ones you love (or even strangers), both online and off. One compliment could make someone's day, and bringing more goodness into the world will definitely help combat the bad. Make sure to follow TheNiceBot here! What do you think of TheNiceBot? Share with us below!